Dana Ruttenberg, a dance artist based in Israel, has a recent work showing at LaMaMa this week (March 7-10), as part of a program titled “Contemporary Israeli Dance Week”. The LaMaMa program is in its second year, and gives a focus to work coming out of the Israeli dance community. Ruttenberg’s contribution to the program is not for the stage, but is instead a 21-minute film, titled Private I’s. 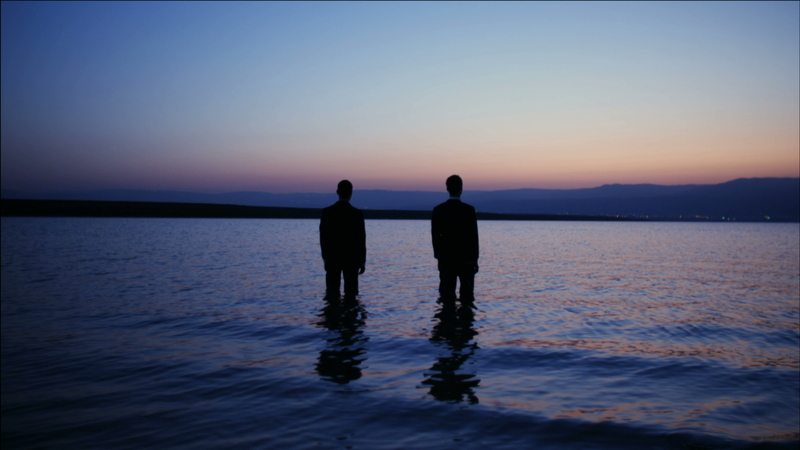 Ruttenberg originally created the work in 2010, later adapting the work for the film, in collaboration with her husband, filmmaker Oren Shkedy. It premiered last summer, and won accolades at the International Screendance Festival 2012 (held at the American Dance Festival, where I had the opportunity to see the film) and the Jumping Frames Festival in Hong Kong. It was a rewarding experience, and when I saw the film would be showing in NYC on the LaMaMa program, I took the opportunity to get in touch with Dana. I managed to catch a presentation she gave on Independent Israeli Choreographers at Barnard College last week, and spoke with her afterwards about her film. The work is for two men, Uri Shafir and Ofir Yudilevitch, dressed in formal attire—black suits and bow ties, white shirts—an intended reference to the James Bond image (one of several meanings layered in the title). The duo enact a series of interactions that seem to be something between playful roughhousing and intimate struggling, never firmly establishing either reading. The movement never holds anything back; it’s always committed, yet manages to remain intriguingly ambiguous. The film continues and expands this ambiguity through the use of stark location shifts with strong and subtle camera play. We see close-cropped shaky frames of two dancers engaged in playfully combative gestures—a shoulder push, an assisted backflip. Later, far off steady shots of a single dancer almost swallowed by a desert landscape. More juxtapositions: the dancers together or solo, in an empty landscape or amidst a man-made structure, in public spaces with pedestrians and cyclists passing through the frame (dancers and passers-by mutually ignoring the other). The performers never explicitly acknowledge the space they are in, continuing the dance as the camera shifts to expose different facets of the choreography. Private I’s is the first film Ruttenberg has made. Prior to creating this, she says, she was highly resistant to the idea of making a dance film, “I was very adamant about staying 3d. I thought that dance had no value if it left the live situation. I have to say, I was wrong.” It was not an immediate jump—she notes that her and Shkedy began by making video artworks based in dance, and acknowledges that their romantic partnership influenced the decision to try working with video. The response they received to the first pieces encouraged them to try to make a full work. The film, which has screened in numerous film festivals around the world, has opened many possibilities for her and her work. She observes with some humor that her work premiered at Lincoln Center last month—not a live work, but her work nonetheless (the film screened in the Dance on Camera 2013 Festival at Lincoln Center). But alongside these opportunities come many questions about making a film that haven’t come up before with live performance. “The film can stay alive and well no matter where its creators are on the globe. It resides outside of our bodies. I wouldn’t be able to stage this dance right this moment, but I can show the film. And the film allows me to capture a moment in time when the piece was in a certain state. These dancers have been doing other things, working with other choreographers—they work with lots of people—so their bodies will be different next time we show it onstage. Not that this is bad, some of it will be good. It’s just that I have no control over the stability of the live piece in that sense. It’s an unknown.” This stability also presents its own questions: choosing one version of the performance to represent the performance always. The live performance can change every time, and over time, but the film is the same each time it is shown. Choosing one version of a scene means choosing it for every instance of the film’s presentation. Yet this doesn’t mean there aren’t magical moments of uncertainty possible in the creation: there is one scene where a bird flies through after a dance sequence has finished. It’s intriguing, and totally unscripted. The unplanned can enter this kind of work, perhaps not in the same way, but with similar effect as when creating a live performance. Another challenge comes in her relationship to the work after its creation has finished. As she puts it, she has to “let go of my ego” regarding the presentation of the work, because most of the time, “the film is seen without me or Oren in the room. It travels without us, and is seen without us.” In other words, her relationship to the audience of her work is necessarily more distant with this film than with her more familiar stage work. It is an interesting dilemma, yet strikes me as somewhat appropriate for this particular work. The film works with these ideas of distance, transporting its performers, almost magically, from one location to another, illuminating how their interpersonal dynamism is both amplified by their surroundings and entirely independent of them. And also emotional distance, as the meaning of the performers partnership is multi-layered and always in flux, they must maintain a certain distance to refrain from flattening those layers. These issues clearly have broader significance to the dance and performance community at large, as it continues to grapple with questions of liveness, audience, distance and distribution. I’m not ready to cover that direction yet, but this film offers a welcome landmark on a developing terrain.